Despite being a small country, Ecuador is amazingly diverse. What it lacks in physical size it more than makes up for in unique cultural history, four distinct geographical regions and rich biodiversity. 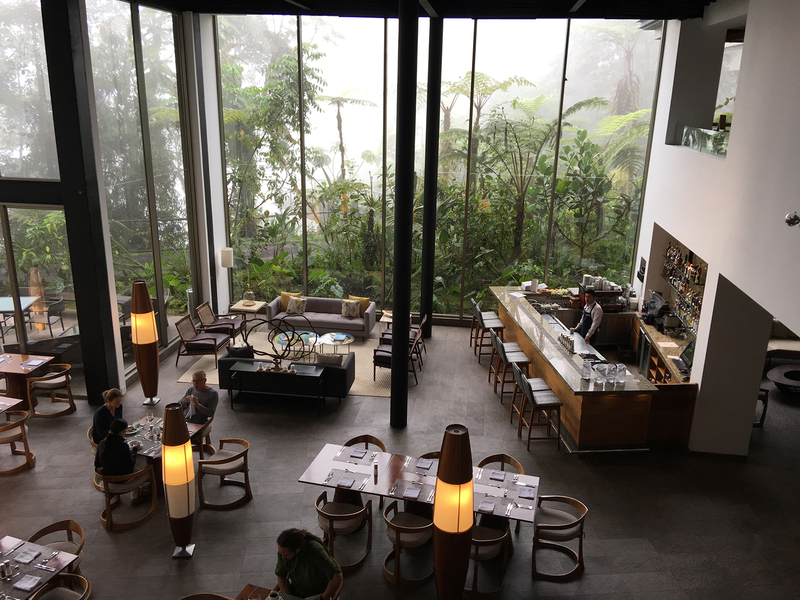 I've visited Ecuador three times over the past 13 years and always discovered something new and fascinating, and my most recent visit this past November, to Mashpi Lodge in the tropical Andes northwest of the capital, Quito, did not disappoint. Situated on a remote 1,300-hectare private ecological reserve in a transition zone between cloud forest and rainforest, where the surrounding jade-green mountains are often shrouded in mist, this spectacular sanctuary has a Jurassic Park feel. Mashpi Lodge is one of only 58 hotels worldwide with the National Geographic Unique Lodges Of The World designation, all of which have to meet strict luxury, environmental, scientific research and local social responsibility standards to receive this prestigious title. The lodge's minimal, open architectural design is intended to foster connection with the surrounding environment. Each of its 20 guest rooms and three suites has a forest view, and the public spaces, including the spacious dining room and Explorers' Bar, are framed by magnificent floor-to-ceiling windows through which to watch the myriad of butterflies and exotic birds swooping through the trees as you savour fine Ecuadorian cuisine. At 900 metres above sea level, the transition zone in which Mashpi Lodge is located bridges the cloud forest — home to multiple species of epiphytes (orchids) and hummingbirds — and the lower tropical rainforest with its abundance of large trees, toucans, amphibians and reptiles. 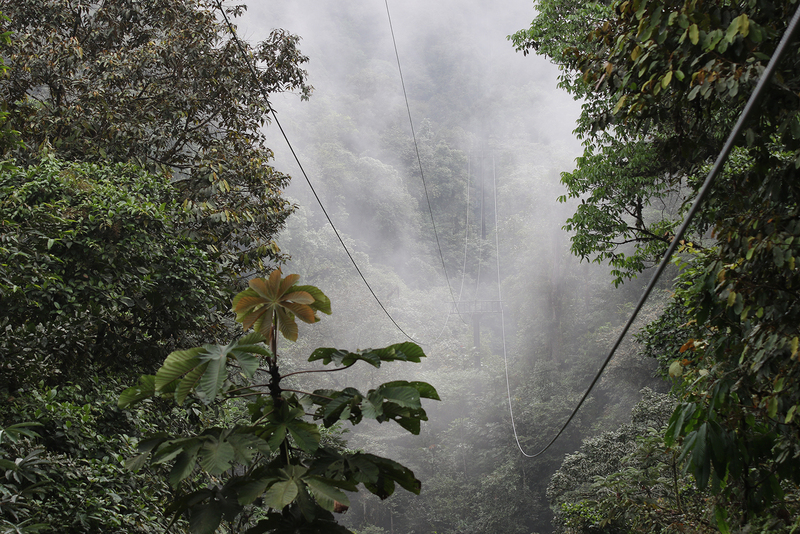 Being located in the transition zone offers the unique opportunity to witness the interactions between cloud and rainforest species of flora and fauna. According to Marc Bery, Mashpi Lodge’s enthusiastic operations manager, a former mayor of Quito, Roque Sevilla, bought the property from a logging company with the intention of conserving it. “The idea of a lodge came a few years later when it was realized that park rangers would be needed to take care of the forest,” he tells me. Most of the staff are recruited from nearby villages, including guide and naturalist Nestor Paladines. A long-time employee at Mashpi, Nestor hails from the neighbouring village of Pachijal and taught himself English in order to better share his passion for the nature with guests. Wearing rubber boots and aided by walking sticks provided by the lodge, we follow him out into the bush. 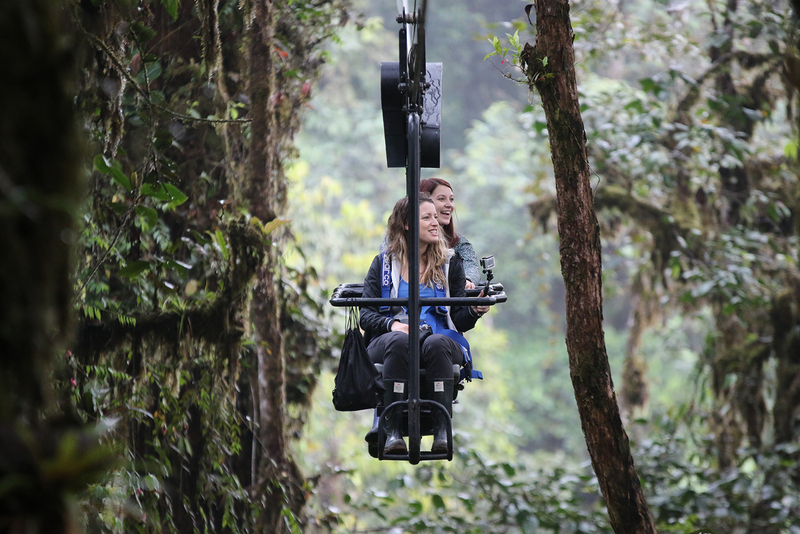 He leads us along a slippery mud path to the Dragonfly, a two kilometre-long, horizontal five-person ski lift-type system that floats over and through the rainforest’s canopy, affording us a close look at this sensitive and unique ecosystem. (The lodge also offers a 'Sky Bike,' which allows for self-powered exploration of the forest heights.) We get off at the halfway point and climb down the tower to the floor of the rainforest below and make our way into the Magnolia River, where we slowly begin the three-kilometre trek upstream through the river’s shallow water toward the lodge. We stop to rest at the base of Magnolia Falls, and a few guests seize the opportunity to take a refreshing dip. 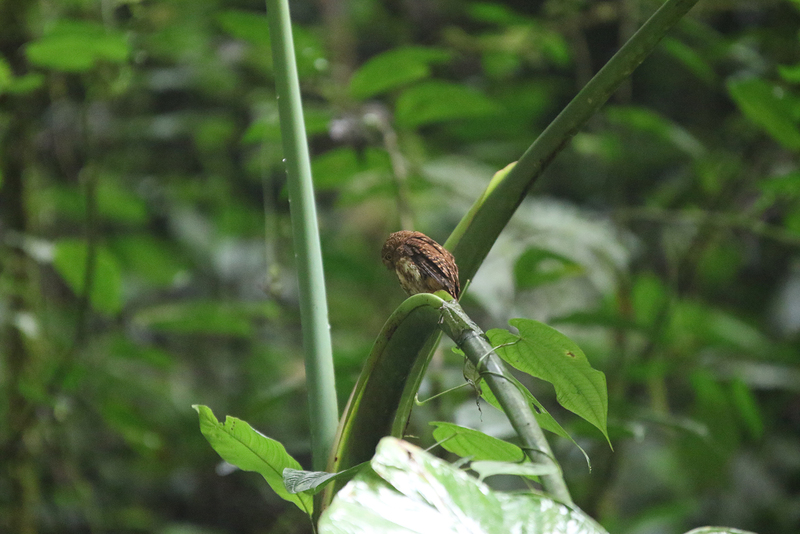 While the frolicking is going on by the waterfalls, Nestor spots an extremely rare cloud-forest pygmy owl sitting motionlessly above us on a tree limb. The owl remains with us for awhile before flying downstream, quickly disappearing into the mist shrouded, evening dusk. As we make our way up a steep, muddy, hand-carved trail, we are pleasantly surprised to come across a perfectly set table complete with wine, glasses and an array of cheeses and thinly sliced local meats, perched on a cliff overlooking the twilit valley below. The serene beauty of it all settles in as we toast the end of a perfect day at Mashpi Lodge. The writer was a guest of Copa Airlines and Mashpi Lodge; they did not review or approve this article.